Oh right, my new shorts! As for the pattern, no surprise, Deer&Doe again: the Châtaigne shorts, that you have probably seen all over the blogosphere and more. But it makes sense, it’s a great pattern, plus it’s easy to sew as long as you don’t forget to think and sew the pocket to the crotch seam twice ahem, so anyway I’m obsessed with Deer&Doe and there’s that. It’s actually the second time I’ve made this pattern. I made a first version last spring, in a bright blue cotton with high waist and golden buttons, in a very nautical spirit. Except that this version was quite a fail: turns out I have a very long bust and a very high waist, so the fitted waistband was riding up and pulling the whole thing upwards in a very uncomfortable way. So the shorts ended up in the trash, minus the buttons of course (I’m saving them for a future attempt). For this one, I planned ahead and lengthened the waistband pieces just below the waistline, of an inch. Fit-wise it’s perfect, the waist line is right on my natural waist. However, the highèwaist cut, that was already quite high, ends up preeetty high now. With a belt I do like it, but I end up wearing it with a shirt on top more often than not. 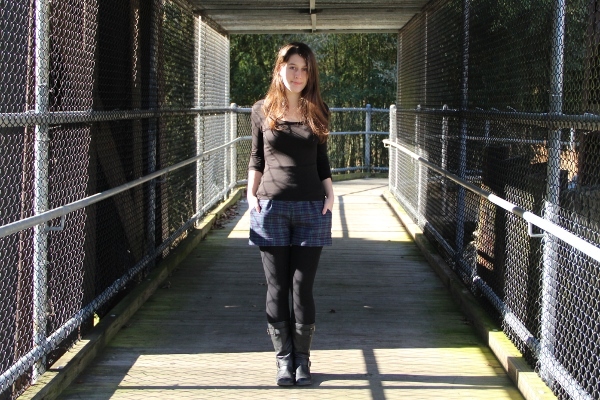 The fabric was a leftover from this failed skirt, though I had originally bought it a long time ago (8 years??!! 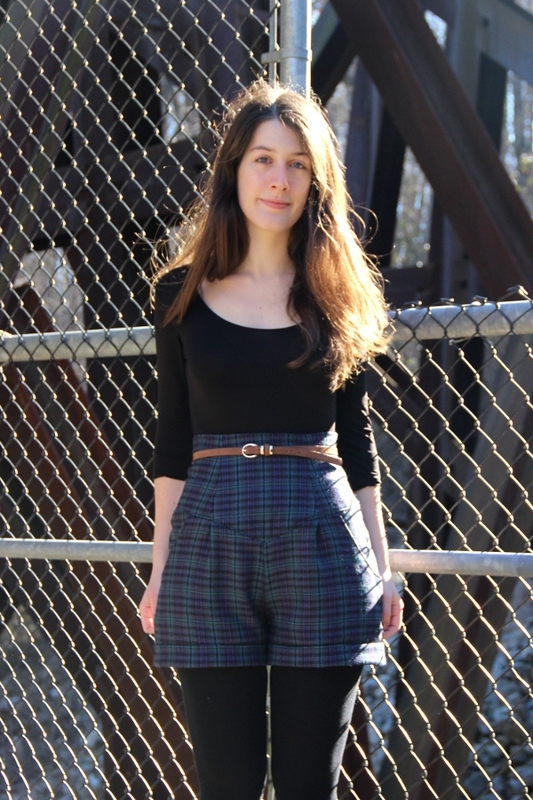 That’s insane…) to make high-waisted shorts, this Burda pattern more specifically. I had made the pants variation, but due to a poor fabric choice they turned out not so great (I wore them for a while but I’m afraid I looked like some sort of sad clown) and so I ended up never making the shorts. Still, the fabric did serve for high-waisted plaid shorts in the end! Same thing at the back, I’m quite pleased with how the pockets and the cuffs line up. It doesn’t look so great on the picture but I swear they do! It’s actually the first time that I wear shorts in the winter, as far as I can remember. And it’s pretty neat! They are short shorts, that is true, so I’m not at the point of feeling comfortable wearing them at work yet. But they are so comfy! Even the high waist is, I like it better than lower waistlines that cut in your stomach every time you sit down. I’m still tempted to modify the waistband next time and cut it at the waistline because (1) I like to contradict myself and (2) if I add buttons, I won’t be able to wear it with a shirt on top or a belt. So, I’d go for something like this, but more “shorts” and less “oops, forgot to put on pants today”. What do you think? The shorts are looking really good on you. And really impressive stripe matching overall. I’ve always struggeld with high-waist garments because I thought the tend to restrict my stomach when sitting down, but maybe that’s a fallacy and I should reconsider that. I’m so glad to know I’m not alone! As for the high waist, I know what you mean on the sitting down part and it’s true that they tend to do that, but I don’t find it that uncomfortable. I do change into yoga pants when I come home after a long day of wearing belted high-waisted skirts though! Your shorts are lovely, and I’m very impressed with your pattern matching. These look great – and I don’t even like plaid. You did such a lovely job sewing them!